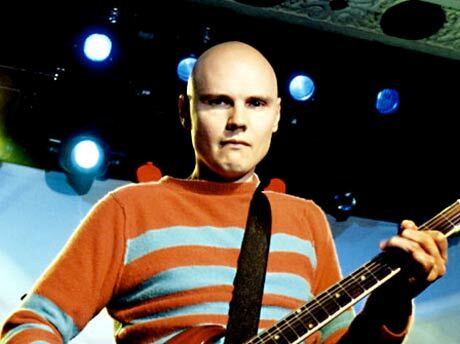 Seemingly unhinged man-about-town Billy Corgan had a wild 2009, and here's hoping 2010 won't disappoint. To start, the man is launching a new, as-yet-unnamed record label with sometimes Smashing Pumpkins producer Kerry Brown. "We are very excited to be collaborating with amazing artists that have made a huge impact on the underground music world... From the psychedelic garage rock of the 60's and the punk rock insanity of the 70's and 80's to the post-punk Pleiadian power-pop that is now." So far, Corgan and Brown have roped in a pretty eclectic and interesting roster, which includes the Germs, the Electric Prunes, Fancy Space People, the Strawberry Alarm Clock, YaHoWha 13 and Starchildren, all of whom with be recording new material for the imprint. And while no Jessica Simpson seven-inches have yet been announced, there's still plenty of time. If you're like us, you're probably more than a little curious about what's in store with that release from legendary punkers the Germs, who last year hinted about releasing "new old material." Brown tells us, "In the very near future we plan on recording two [Germs] songs that [the late] Darby Crash wrote with Pat Smear, 'Out of Time' and 'Beyond Hurt - Beyond Help,'" He goes on to say the original line-up - Pat Smear (guitar), Lorna Doom (bass), Don Bolles (drums) - will be recording the songs with actor Shane West, who portrayed Crash in the 2007 film What We Do Is Secret and will now take on the fallen front-man's vocals. Meanwhile, we're all holding our breath to find out how, exactly, Corgan came to find God God came to find Corgan. Thanks to L.A. Weekly for the tip.